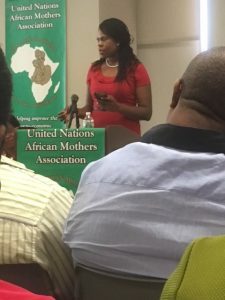 Shannon R. Waite, Ed.D., GSE Clinical Assistant Professor, Division of Educational Leadership, Administration, and Policy, was tapped this spring by the United Nations African Mother’s Association (UNAMA) to deliver the keynote address at their annual Day of the African Child event. The day marked the 42nd anniversary of the death of school children in South Africa who initiated a non-violent protest for change in their country, and draws attention to the lives of African children today. Each year, UNAMA honors a graduating senior, and this year’s honoree is Stuyvesant High School student Venus Nnadi, who was accepted at each of the 18 colleges she applied to including all eight Ivy League institutions.